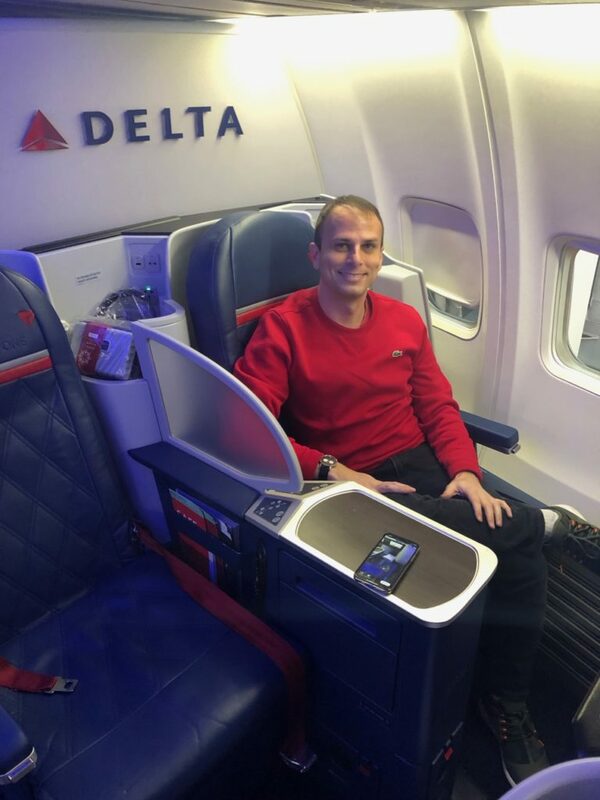 Delta notes that domestic Delta One flights offer “flat-bed seats, elevated amenities and a refined dining experience,” differentiating them from the typical domestic first class experience you’d get on other flights. So in theory, this should be the most “elevated” and “refined” service out of DCA. As an award redemption, the DCA-LAX flight in Delta One is typically very pricey under Delta’s variable pricing scheme. The cheapest it seems to go for is 50,000 miles, but it can be much more than that. In my opinion, there are better ways to spend your SkyMiles. I had an annual companion certificate through my Delta Platinum American Express. In addition, I had four regional upgrade Choice Benefits certificates thanks to my Platinum status on Delta. 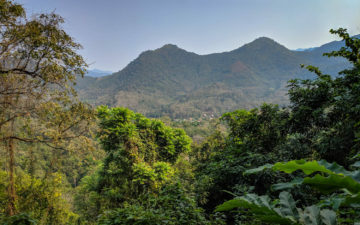 Thankfully, these two benefits can be combined: I purchased two round-trip economy tickets, one for me and one for my boyfriend — and with the companion certificate, they came to about $160 per person. Then I called Delta and asked them to apply my Choice Benefits certificates to those flights. They applied them, but were unable to immediately confirm the upgrades. When you’re upgraded to Delta One, you get access to Delta Sky Clubs. (I normally have access for myself through my American Express Platinum card, but it doesn’t allow me to bring a guest for free.) So we spent a few minutes in the lounge before heading over to the gate. The flight began boarding right on time. We boarded through the second door on the left side of the plane, in between the Delta One and Comfort+ cabins. The seats are arranged in a 2×2 configuration, with a single aisle in the middle. They are angled slightly toward the windows. I don’t love the blue and red color scheme — it’s a better palette for an elementary school than a premium cabin, in my opinion. But I really like everything else about the cabin. Waiting at the seat were a Tumi amenity kit, headphones, bottled water, bedding, and a menu. These headphones look nice, but they aren’t super comfortable…and they’re not noise canceling. Unfortunately also waiting at my seat was a used Q-Tip, which is a little gross. The Tumi amenity kit is nice, with some Kiehl’s lip balm and body lotion, toothbrush, Crest toothpaste (the normal travel size as opposed to those tiny ones you sometimes get), tissues, earplugs, an eye mask, and hand sanitizer. I love that hand sanitizer was included (I used it after I picked up that used Q-Tip!). You can have this monogrammed by bringing it to a Tumi store. Shortly after we were seated, a flight attendant came over to welcome us aboard and offer us a beverage. We both chose champagne (or, more accurately, sparkling wine). They took beverage orders, and few minutes later they came by with a ramekin of nuts and our drinks. For dinner I had pre-ordered the chicken. It came with mashed potatoes and green beans, and was covered in a red sauce with veggies. My past experience with Delta domestic meals hasn’t left me too impressed, but this was actually very good. The salad, shrimp, and bread that came with it were also really good. My boyfriend pre-ordered the steak for his meal, which came with broccolini and potatoes. He really enjoyed it. For dessert they offered either fruit (as if!) or a fudge sundae (that’s more like it). It also had a tasty crumbly crust on top. The TVs all had Delta Studio featuring Delta’s free suite of entertainment options, including on-demand TV shows and movies, as well as some live TV. I watched a documentary called Pick of the Litter, about Labrador retrievers being raised to help visually impaired people. The puppies were so damn cute. After dinner I made a quick visit to the lavatory, which isn’t super exciting (though I appreciated the touch-free flush option). 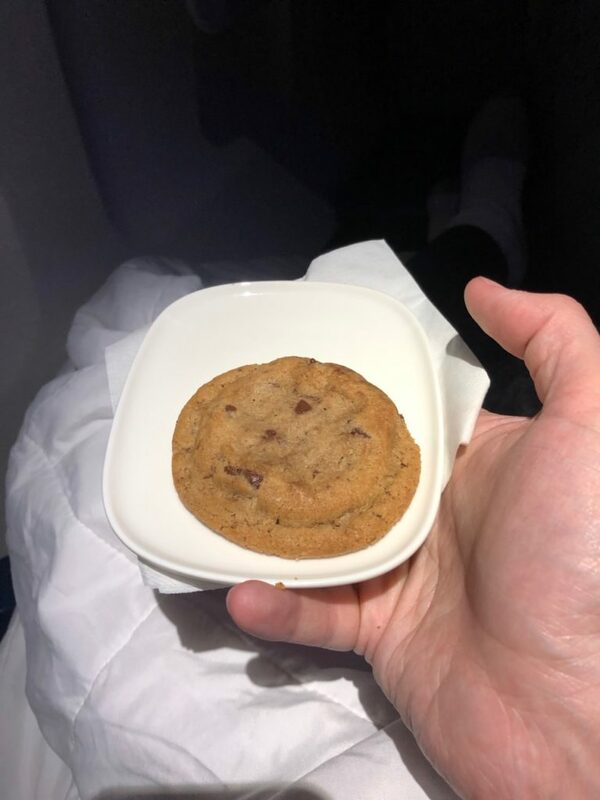 About an hour before landing we were served warm chocolate chip cookies. Mine was delicious. We landed in Los Angeles around 8 pm local time and had a fairly long taxi to the gate. Our flight from LAX to DCA was on the same aircraft type (a 757-200) and I even sat in the same seat (4A). It’s a daytime flight, leaving LA shortly after 8 am and arriving in DC around 4 pm. 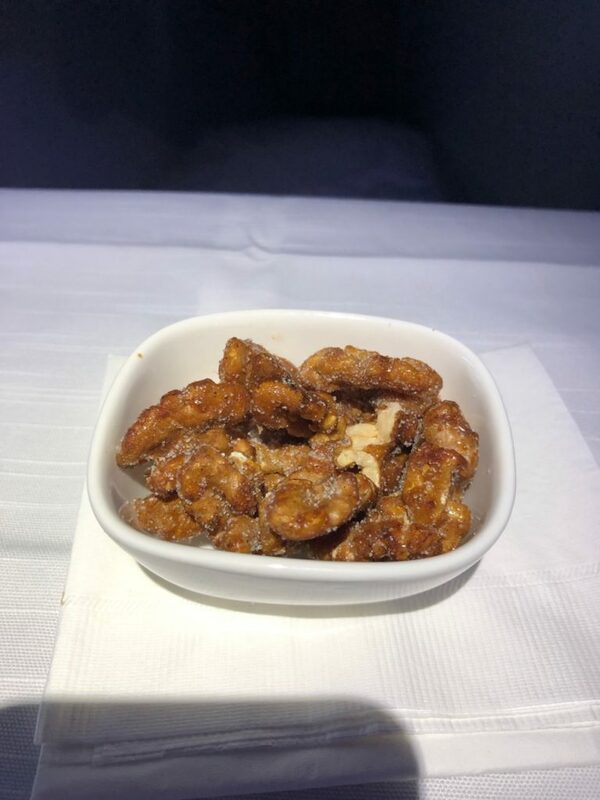 Shortly after takeoff they served candied nuts. 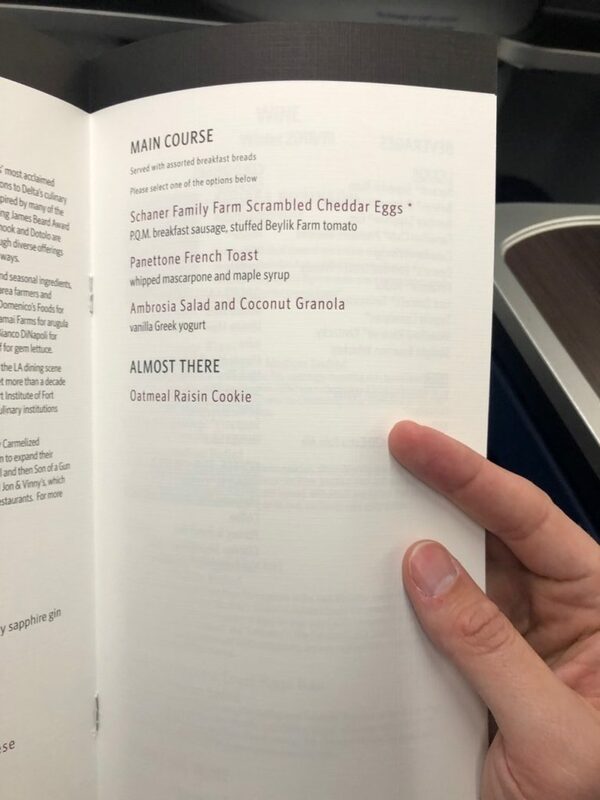 The meal served on this flight was breakfast. My boyfriend and I both pre-ordered the French toast. About an hour before landing they offered hot oatmeal raisin cookies. I didn’t have one because to me oatmeal raisin cookies are just chocolate chip cookie wannabes. Then as we were descending they came around with Ghirardelli chocolates. There are very few situations in which I would turn one of those down. And then in an act of true selflessness, my boyfriend gave me his too! Service on the return flight was even better than on the outbound. One of the flight attendants was on both flights, and she recognized us on the return and welcomed us back. This was a really solid flight. Even better, combining a companion certificate with a Choice Benefits upgrade made this an amazing deal. Wait, you were freaked out by a single cockroach in your vacation rental in Palm Springs, but completely nonchalant about that disgusting Q-Tip. Somethings off here. If there was ever a time to throw a fit and look for compensation, I’d vote for Q-tip over cockroach any day. Great! But are you planning a review for the Skyclub at DCA? It got renovated a few months ago, and there aren’t many reviews online currently of the renovated skyclub. JetBlue will never fly transcons out of DCA because the short runway there means you’d need a 757 to do it (high thrust to weight ratio). Also DCA (and LGA) have perimeter rule restrictions meaning flights over ~3-4 hours need special exemptions to operate. Exemptions are more lenient in DCA than LGA. The Q-tip is f’n gross. I’d emailed Delta customer service about that and surely they’ll throw some Skypesos your way to compensate you for that nasty sh*t.
No use of the wifi? Wonder what the price on board is versus the $16 charged at booking. 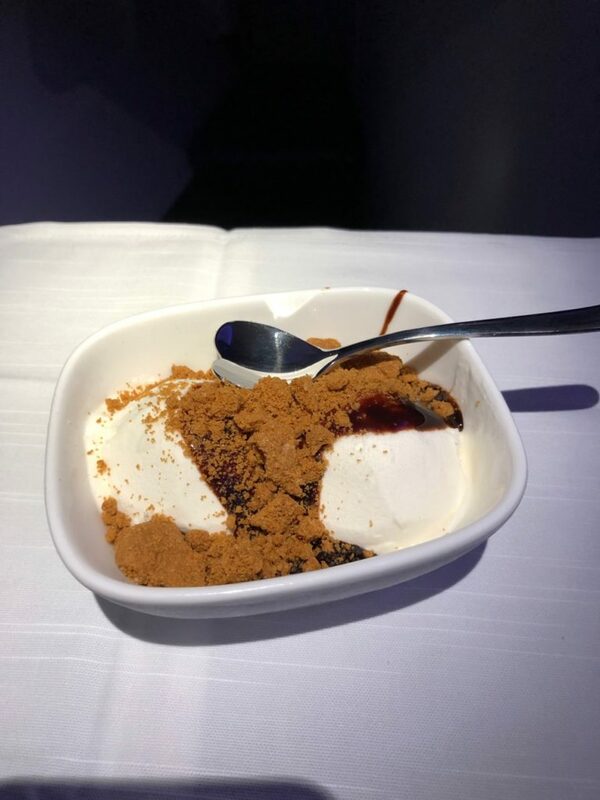 Seems like a decent flight but wow, that food looks… sad. Food looks pretty decent to me – not sure what @Alpha is expecting. Particularly the beef. Chicken looks kind of meh. Also, who the f*ck cleans their ears while sitting in their seat on a plane!?! That is just weird. The Qtip is gross. that q tip on the plane is worse than a bug in a hotel room… did you dispute the charge for the flight before or after you landed? @neil – they havent done that landing procedure at DCA for YEARS. Just curious, did they serve ketchup with the shrimp appetizer? That did not look like cocktail sauce lol. @neil DCA is my home airport. I didn’t fly regularly after 9/11 as I was in high school at the time but the approach protocol seems normal to me. Could still be the case, though. Qtip is beyond disgusting both being used at the seat and left behind. I mean that’s seriously gross. Regular DCA flyer. The formal approach protocol is gone. But I do feel they turn on the fasten-seat belt sign earlier than a lot of other flights. 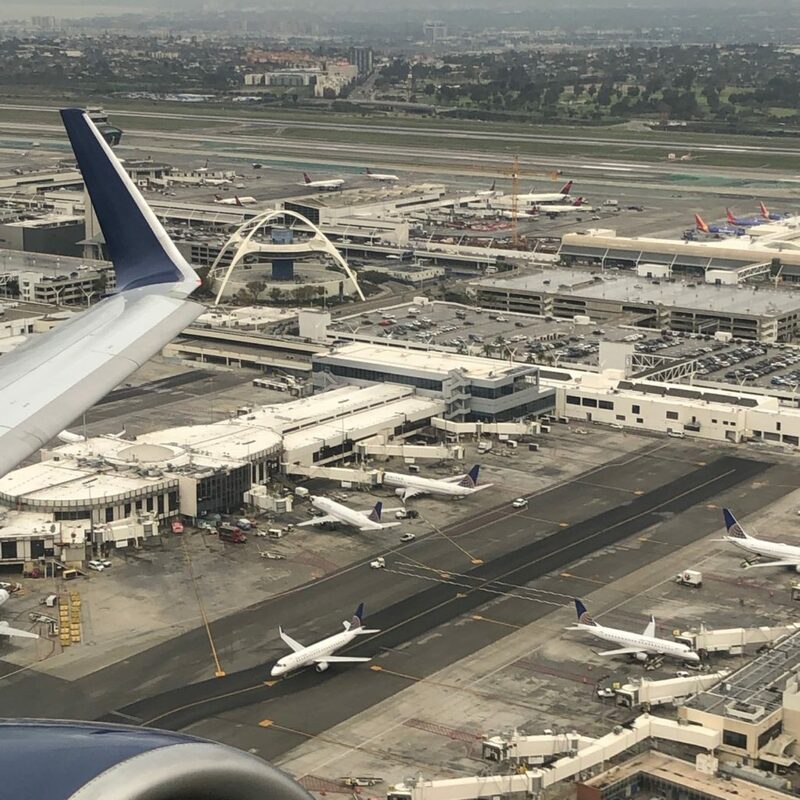 I’m an AA flyer who routinely goes to LAX on the 737 MAX. If Delta ever improved their SkyPescos redemption, people like me would flock in a heart beat to DL. I must have been on the inbound flight from LAX on the same day, because that’s my q-tip from seat 4A! Glad you enjoyed it. I really enjoyed this review! Loved the review and your cheeky comments! Hope you and your boyfriend had a great trip! Enjoy hearing about him a little bit as I think it adds some personality to the review! keep it up! Too cheap to spend $175 for an AU card so your boyfriend (+2 others) can access SkyClub? Thanks for this review. I always fly the 757 United PS service to EWR from SFO. I also fly frequently into Washington area. 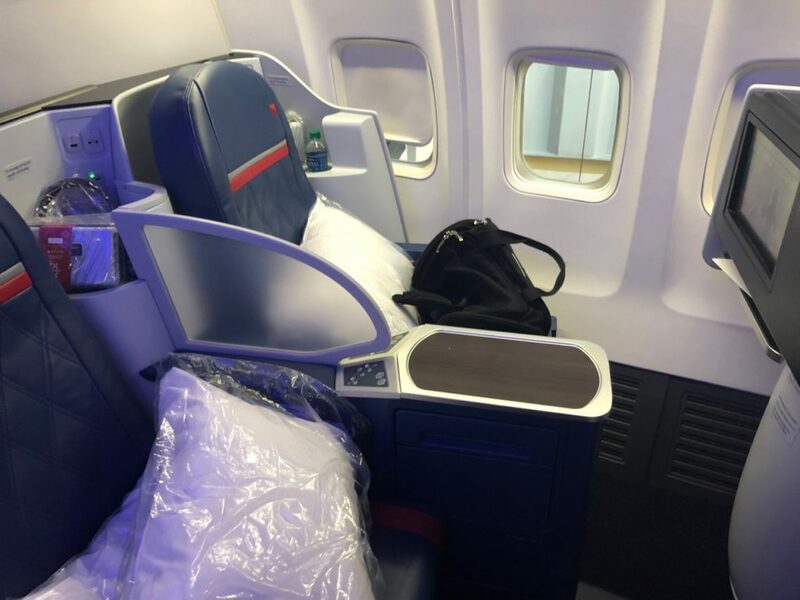 It appears that the seat & service on the Delta One 757 is almost exactly as the seating & service of the UA PS 757 seats & service. Unfortunately, if you had notified the crew re the used q-Tip, they probably would have shrugged it off! It appears the Qtip was on the small tray that slides into the armrest area. The obviously tacky previous passenger apparently placed it there then secured the tray. Those trays are not touched unless the aircraft has numerous hours between flights. Crass people are everywhere. Airlines cannot discriminate, waxy ears and tacky behavior is not a reason to deny any passenger. Yes it was gross. Blame the culprit. I lost track of the number of times you mentioned your boyfriend. Congrats on sharing what must be an apparently new experience for you. I do not bother with social media – speaking only for me viewing pictures of anyone’s food seems a total waste of time. Everyone eats food. Enough said. Moving on – just as I did once I saw pix of a tray of airline food. I should have exited with the first ramekin of nuts appeared. Seriously?!? It was just nuts in a tiny container. This highlights part of AA’s problems. DCA-LAX flies between two of AA’s hubs and yet they offer plain old 737s with recliner seats (and even the MAX on some flights). 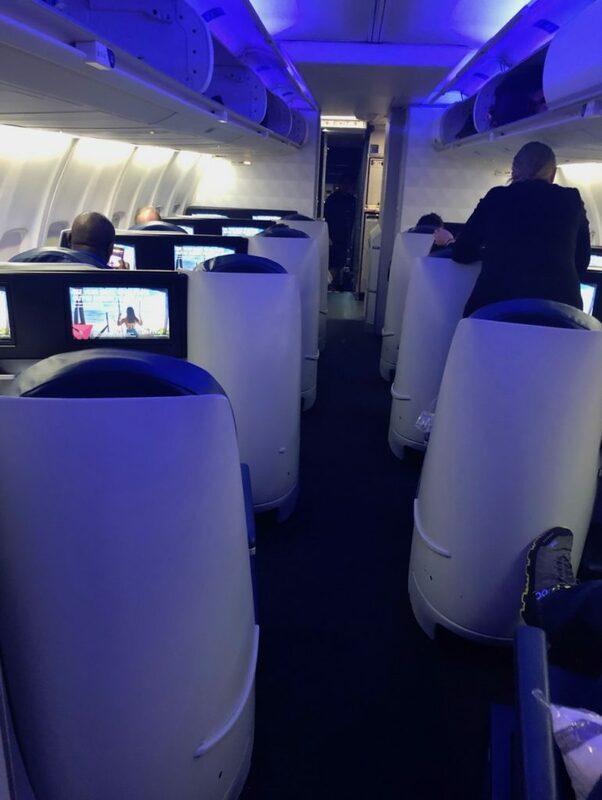 While Delta can seemingly offer a much higher end product and has found a market of people willing to pay for it. AA needs to pay attention. DCA is their market to lose. If they would just up their game, there are plenty of people here willing to pay for it. AA also needs to figure out what to do about the capacity constraints of DCA. They have a big base of elites here but not enough flights. Maybe start offering at least a little more capacity out of IAD. 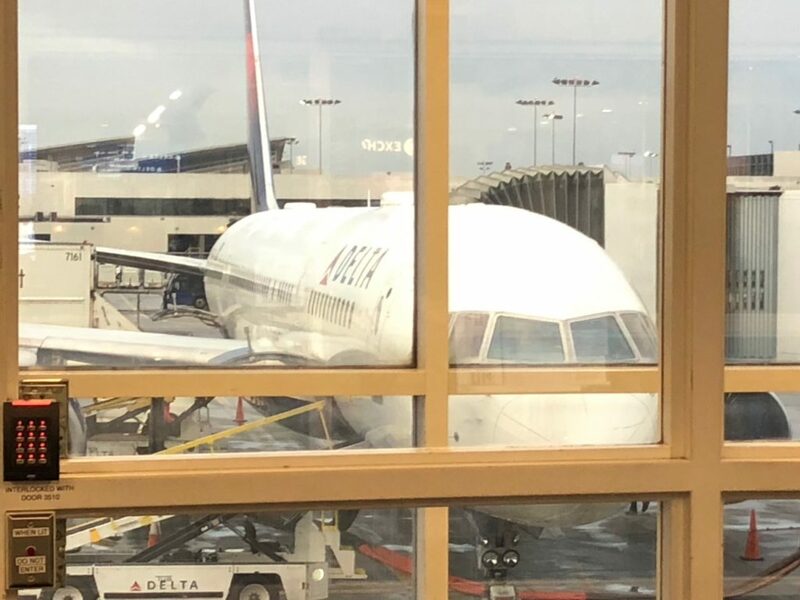 They don’t even fly to some of their biggest hubs (ORD, MIA, PHL, JFK) out of Dulles yet someone like Delta manages to fly to DTW, MSP, JFK (and of course ATL). What is wrong with AA? A part of me doesn’t believe you. I’ve been DM/PM in Delta for a couple years and I’ve never been able to apply certificates towards a flight bought with the BOGO AmEx Delta Platinum card. It is against their rules, and no exceptions (I have tried HUCA a couple times) yet somehow you got it applied in your first call no problem. Hm. I guess I’m just mad at Delta, sorry. 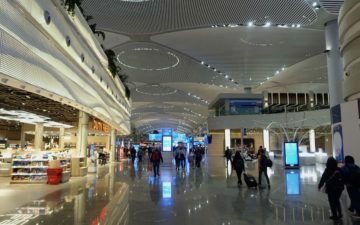 Did you use the SkyClub in LAX? Where are the pics? You complain about the red and blue cabin color palette while wearing a solid red sweater and solid blue jeans. @Alonzo: It was cocktail sauce, I promise! @Scott: Totally agree with your points on AA. 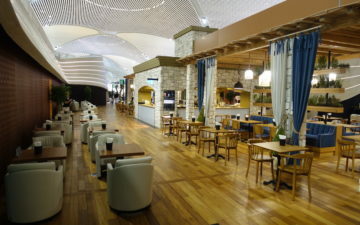 Nice review overall, but it would have been nice to see a few pics of the lounge as well, since it isn’t a lounge you see featured in many trip reports. Thanks for the TUMI discount code in one of the images! 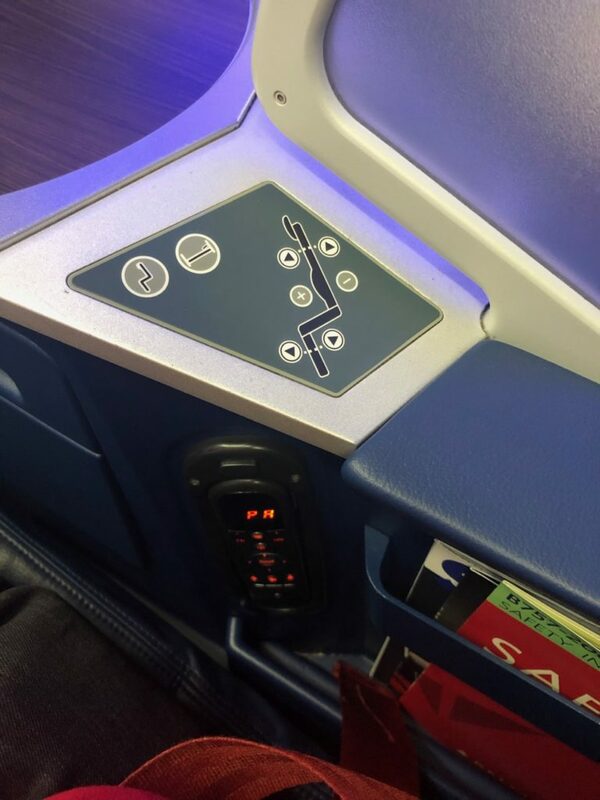 So wait, lie-flat seats and both legs are daytime flights? Where’s the consistency, DL? No used cotton swab on the return trip??? Sheesh! 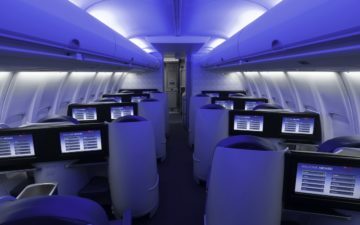 Nice report about Delta One from DCA-LAX. Looks like you had a great flight! Did you get the Tumi amenity kit on the daytime flight back to DCA? 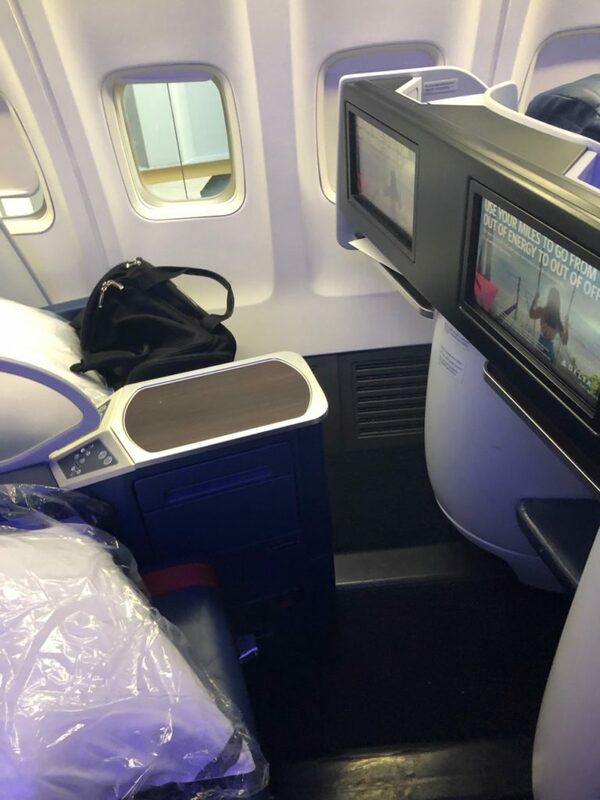 @Tom: The upgrade certificate which accompanies the Delta SkyMiles Platinum American Express only began allowing upgrades in 2018. Prior to that, you stayed in main cabin regardless of your status. On a recent flight we were both upgraded on two of our four segments using this companion certificate. I’m only a lowly Silver Medallion, so I was pleasantly surprised. (PHX-MSP and OMA-DTW). Eastbound departure @ LAX. In 2018 delta claimed they would entirely rebuild terminal 3 The SkyWay Still waiting. … nothing … t2/3 need to be integrated t2 with a nice new sky club Not the awful one they presently have there When ? Meanwhile AA is redeveloping t4/5 But t3 remains the worst at LAX. By all accounts DL does everything right. So why oh why do they leave me so cold unlike any other carrier?? There is something off, something below the surface that is not quite right. Their interiors are hideous and look like they belong on a LLC in China.!! @scott most AA customers fly out of DCA. Also, AA doesn’t have the right aircraft for lie flat seat service. They few 757 left are used for international flights. Like Lima and AMS out of phl. They are not going to put a larger aicraft / and they are not willing to remove any 321t out of New York.